This package includes all of Tony’s premium picks from the NBA today for only $20. Tony guarantees at least 2 premium picks today or receive tomorrow’s NBA Premium Picks Package at no charge. This package includes all of Tony’s premium picks from the NBA for 7 days. You will receive a user name and password to access your picks. Picks are posted by 8AM. Cost $75. This package includes all of Tony’s premium picks from the NBA for 30 days. You will receive a user name and password to access your picks. Picks are posted by 8AM. Cost $199. This package includes all of Tony’s premium picks from the NBA for 60 days. You will receive a user name and password to access your picks. Picks are posted by 8AM. Cost $299. This package includes all of Tony’s picks from the NBA for 3 Months. You will receive a user name and password to access your picks. Picks are posted by 8AM. Cost $399. This package includes all of Tony’s premium picks from the NBA for up until the final game of the NBA Championship Series. You will receive a user name and password to access your picks. Picks are posted by 8AM. Cost $799. This package includes all of Tony’s premium picks from NCAA College Basketball today for only $20. Tony guarantees at least 2 premium picks today or receive tomorrow’s NCAA College Basketball Premium Picks Package at no charge. This package includes all of Tony’s premium picks from NCAA College Basketball for 7 days. You will receive a user name and password to access your picks. Picks are posted by 8AM. Cost $75. This package includes all of Tony’s premium picks from NCAA College Basketball for 30 days. You will receive a user name and password to access your picks. Picks are posted by 8AM. Cost $199. This package includes all of Tony’s premium picks from NCAA College Basketball for 60 days. You will receive a user name and password to access your picks. Picks are posted by 8AM. Cost $299. This package includes all of Tony’s picks from NCAA College Basketball for 3 Months. You will receive a user name and password to access your picks. Picks are posted by 8AM. Cost $399. This package includes all of Tony’s premium picks from the NFL for until the Super Bowl. You will receive a user name and password to access your picks. Picks are posted by 8AM. Cost $549. This package includes all of Tony’s premium picks from NFL Pro Football today for only $20. This package includes all of Tony’s premium picks from NCAA College Football up until the 2010 BCS Championship Game and NFL Pro Football up until the Super Bowl. You will receive a user name and password to access your picks. Picks are posted by 8AM. Cost $1099. Order online or you may charge by phone by calling our toll free number at 888-711-1185 with your major credit card. This package includes all of Tony’s premium picks from NCAA College Football for 3 Months. You will receive a user name and password to access your picks. Picks are posted by 8AM. Cost $340. This package includes all of Tony’s premium picks from NCAA College Football up until the BCS Championship Game. You will receive a user name and password to access your picks. Picks are posted by 8AM. Cost $549. This package includes all of Tony’s premium picks from NCAA College Football today for only $20. Tony guarantees at least 2 premium picks today or receive tomorrow’s NCAA College Football Premium Picks Package at no charge. This package includes all of Tony’s premium picks from NCAA College Football for 30 days. You will receive a user name and password to access your picks. Picks are posted by 8AM. Cost $140. This package includes all of Tony’s premium picks from NCAA College Football Bowl season up until the BCS Championship Game. You will receive a user name and password to access your picks. Picks are posted by 8AM. Cost $120. This package includes all of Tony’s premium picks from NCAA College Football up until the 2011 BCS Championship Game and Pro Football up until the Super Bowl. You will receive a user name and password to access your picks. Picks are posted by 8AM. Cost $1098. Order online or you may charge by phone by calling our toll free number at 888-711-1185 with your major credit card. This package includes all of Tony’s premium picks from MLB today for only $20. Tony guarantees at least 2 premium picks today or receive tomorrow’s MLB Premium Picks Package at no charge. This package includes all of Tony’s premium picks from MLB for 7 days. You will receive a user name and password to access your picks. Picks are posted by 8AM. Cost $75. This package includes all of Tony’s premium picks from MLB for 30 days. You will receive a user name and password to access your picks. Picks are posted by 8AM. Cost $199. This package includes all of Tony’s premium picks from MLB up until the final game of the 2007 World Series. You will receive a user name and password to access your picks. Picks are posted by 8AM. Cost $799. This package includes all of Tony’s NFL, NCAAF, NBA, NCAAB and MLB picks he releases for 1 Month. Includes Best Bet releases. You will receive a user name and password to access your plays. Plays are posted by 8AM. Cost $300. This package includes all of Tony’s premium NFL, NCAAF, NBA, NCAAB and MLB picks he releases for 1 week. Includes Best Bet releases. You will receive a user name and password to access your plays. Plays are posted by 8AM. Cost $100. This premium package includes all NFL, NCAAF, NBA, NCAAB and MLB picks from today for only $40.00. Includes Best Bet release. 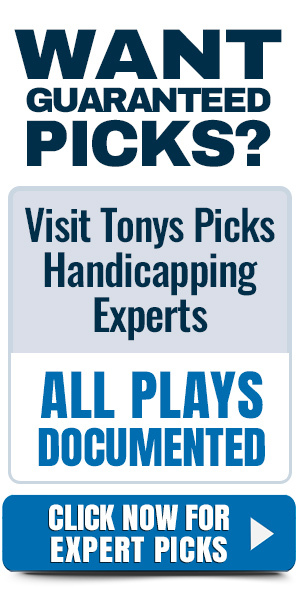 Tony guarantees at least 4 premium picks today or receive tomorrow’s All Play Premium Picks Package at no charge. This package includes all of Tony’s NFL, NCAAF, NBA, NCAAB and MLB plays he releases for 2 Months. Includes Best Bet releases. You will receive a user name and password to access your plays. Plays are posted by 8AM. Cost $549. This package includes all of Tony’s premium NFL, NCAAF, NBA, NCAAB and MLB picks he releases for 3 Months. Includes Best Bet releases. You will receive a user name and password to access your picks. Picks are posted by 8AM. Cost $799.